"Aztalan" redirects here. For the town, see Aztalan, Wisconsin. Not to be confused with Aztlán. 1855 map of Aztalan historical site; north is to the right. 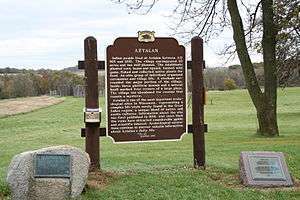 Aztalan State Park is a Wisconsin state park in the Town of Aztalan, Jefferson County, Wisconsin at latitude N 43° 4' and longitude W 88° 52'. Established in 1952, it was designated a National Historic Landmark in 1964 and added to the National Register of Historic Places in 1966. The park covers 172 acres (0.7 km2 or 70 ha) along the Crawfish River. Aztalan is the site of an ancient Mississippian culture settlement that flourished during the 10th to 13th centuries. The indigenous people constructed massive earthwork mounds for religious and political purposes. They were part of a widespread culture with important settlements throughout the Mississippi River valley and its tributaries. 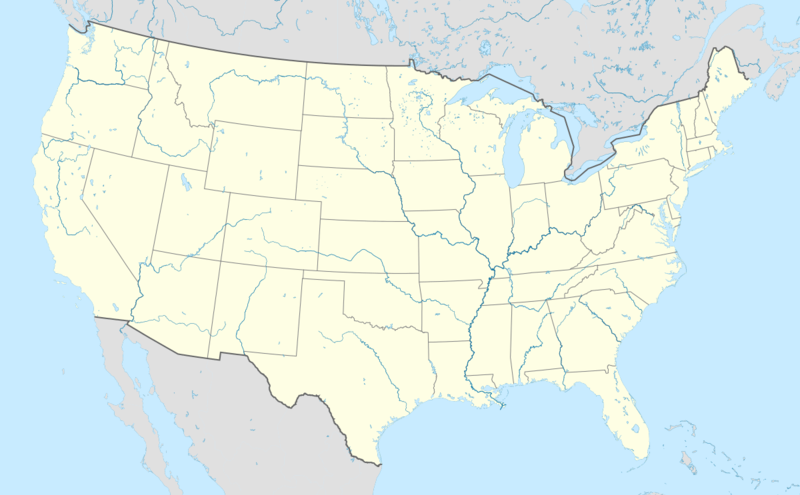 Their trading network extended from the Great Lakes to the Gulf Coast, and into the southeast of the present-day United States. Aztalan was first settled around 900 by a Native American culture known as the Middle Mississippian Tradition. The chief center of a Middle Mississippian settlement is at Cahokia, in present-day Illinois, a city that at its peak had 20,000-30,000 people. This was not surpassed by Europeans in North America until after 1800. 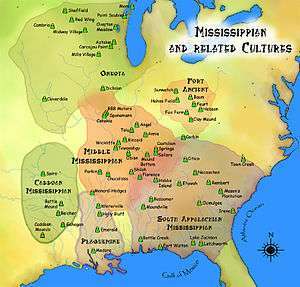 These settlements are characterized by the construction of mounds, stockades, and houses, by decorated Mississippian culture pottery and agricultural practices. There are also elements of the Woodland culture found here. The residents had long-distance trading relationships with other settlements, linked by their use of the rivers for transportation. For example, items found at the settlement include copper from Michigan's Upper Peninsula, shells from the coast of the Gulf of Mexico, and stone such as Mill Creek chert from other areas of the Midwest. Sometime between the years 1200 and 1300, the Aztalan settlement was abandoned. Archeologists and historians surmise they may have outgrown environmental resources, or encountered more warfare from other cultures, but do not know for sure. The Little Ice Age occurred soon after 1300 and may have contributed to farming difficulties, putting too much stress on the local chiefdoms. Most of the residents lived in circular or rectangular houses which they built between the river and the Eastern secondary wall. The placement of the structures suggests that the layout was planned. The dwellings were built around a central ceremonial plaza likely used for rituals and public gatherings, as has been found at other similar locations. Posts for the house frames were either placed in individual holes, or in a trench dug slightly narrower than the posts. Walls were completed with wattle and daub, a plaster mixture of grass and clay, and the roof covered with bark or thatch. The doorway usually faced south to keep out the winter's north winds. Inside, a single family slept on pole-frame beds, covered with tamarack boughs, deer skins, and furs. Sometimes a fire was kept in the middle of the house and a hole in the roof let out the smoke. Pits dug in the earthen floor of the house held stored foods such as corn, nuts, and seeds in woven bags. Perishable foods like meat were probably stored outside prior to cooking. Pits outside were also used for garbage and community resources . The site was well chosen to provide a variety of food sources, and other resources. The staple of the diet was corn or maize, and other plants were also gathered as food, such as acorns, hickory nuts, and berries. Tobacco was grown at this time for sacred rituals, as tobacco seeds have been found at this site. The main source of meat was deer, especially in the winter. The people also caught and ate beaver, elk, fox, muskrats, and raccoons. They hunted birds and turtles, collected mussels, and caught fish in the Crawfish River directly next to the site. To help with fishing, the people set up rock barriers called fish weirs at key points, one of which is visible when the river is low. They caught catfish, bass, suckers, buffalo fish, pike, drum fish, and gar. They disposed of the thousands of shells from consumed mussels in middens. These have layers of shells several feet thick . The people gathered most of the raw materials for tools and building in the area, and obtained others through trade from remote places. Trees nearby provided wood for posts for house walls and stockades, bows and arrow shafts, bowls and spoons, and firewood. Smaller tree branches and grass were used for bedding and roofs. Shells were used to make jewelry, beads, spoons, and digging tools. The people dug river clay which was used to fashion fired pottery. Ornamental and exotic objects, or objects made from foreign materials, are commonly associated with status. The most obvious features of Aztalan are its pyramid-shaped, flat-topped platform mounds and the stockades, believed to have served both ceremonial and defensive functions. Three platform mounds remain on the site. The largest is the one in the southwest corner of the stockade; one almost as large is located in the northwest corner. The smallest of the three is along the east side of the settlement, near the Crawfish River (labeled "West Branch of Rock River" on the plates). The hill in the southeast corner is a natural gravel knoll, not built by the inhabitants. 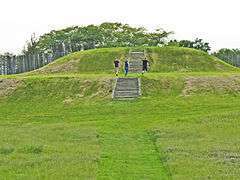 The largest mound was built in three stages, with a set of steps leading to the top, where a structure was built over the entire flat top. The mound was covered with a clay cap, probably to enhance its appearance. Corn was stored in pits inside the structure. Scholars have several theories about why the corn was kept here, and the overall purpose of the structure. This may have been the storage facility for the entire village; storage for food just for the top village officials; it may have been used for ceremonies and rituals; or it could have been a house for the village officials. This topmost structure was rebuilt each time a larger stage of the mound was built on top of the old. The northwestern mound, used for formal burial, was also built in three stages. 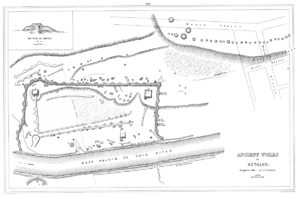 A special structure, approximately 4 metres (13 ft) by 2 metres (6.6 ft), with its long axis towards the northeast/southwest, was built on the west side of the mound. Its doorway was in its southwest corner, and the structure was covered with a mixture of clay, willow branches, and grass. The floor was covered with a mat of what may have been cattails. The bodies of ten people were placed side by side on this, with their heads toward the doorway. The bones of another person were bundled together with cord and placed near them. Once this construction was complete, and the bodies were inside, the building was burned. The eastern mound had a large open-walled structure, about 12 metres (39 ft) by 27 metres (89 ft), built on top of it, with firepits lined with white sand inside. The function of this mound and structure remain unclear. Additionally, to the northwest of the stockaded area, a row of round mounds extends northward. When archaeologists dug in these mounds during the 1920s, they did not find the burial sites they had expected. Instead, each mound had a large post set in a pit in its center, surrounded by gravel and soil, with the pit capped with clay and gravel to hold the post steady. These mounds have been termed "marker mounds" because they may have been used to mark the site for travelers, but this is not certain. They may also have been used for announcements, message relays, or for calculations of astronomical phenomena, as has been found at other Mississippian sites, such as Cahokia. The settlement was surrounded on the north, west, and south sides by a palisade, a wall of logs set vertically into the ground. Narrow holes were dug into the ground, then the posts were lifted into position and set into the holes. The stockade was finished by people weaving flexible willow branches through the posts, and plastering the whole with a mixture of clay and grass to fill in the gaps, a technique similar to wattle and daub. At some point, a smaller stockade was built within the outer one to delimit the dwelling areas. Archeologists have not been able to determine whether both stockades existed simultaneously, for a layered defense, or one was built after the other fell into disuse. In 1850, Increase A. Lapham, an author, scientist, and naturalist, surveyed the site on behalf of the Smithsonian Institution. He described the outer stockade as being "631 feet (192 m) long at the north end, 1,149 feet (350 m) long on the west side and 700 feet (210 m) on the south side; making a total length of wall of 2,750 feet (840 m). The ridge or wall is about 22 feet (6.7 m), and from 1 foot (0.30 m) to 5 feet (1.5 m)) in height." It had at least 33 square bastions at regular intervals along its length, similar in form and placement to some European fortifications, in order to allow defensive warriors to cover that area by shooting arrows. In addition, others were built along the secondary walls. Rather than having a gate to protect the entrance, the builders constructed the entrance so that it was camouflaged from direct view and blended in with the wall on either side. During the time Aztalan was inhabited, two sets of outer stockades were built. The posts of the first one eventually rotted, and the second one burned and was never rebuilt. It is not clear whether the purpose of the stockade was to keep out invaders, or if the occupants built it for another reason. "The name Aztalan was given to this place by Mr. Hyer, because, according to Humboldt, the Aztecs, or ancient inhabitants of Mexico, had a tradition that their ancestors came from a country at the north, which they called Aztalan; and the possibility that these may have been remains of their occupancy, suggested the idea of restoring the name. It is made up of two Mexican words, atl, water, and an, near; and the country was probably so named from its proximity to large bodies of water. Hence the natural inference that the country about these great lakes was the ancient residence of the Aztecs." Hyer wrote, "We are determined to preserve these ruins from being ruined." However, in 1838, President Martin Van Buren refused a request by Massachusetts statesman Edward Everett to withdraw the site from public sale, and it was sold for $22. In the following years, the surface was plowed, the mounds were leveled for easier farming, pottery shards and "Aztalan brick" were hauled away by the wagonload to fill in potholes in township roads, and souvenir hunters took numerous artifacts. In 1850, Lapham urged the preservation of the stockade. At the time, the stockade was still standing, though not in the condition it had once been. In 1919, archaeological excavations began at Aztalan under the direction of Dr. S. A. Barrett. In 1920, the Landmarks Committee of the State Historical Society of Wisconsin under Publius V. Lawson started a new effort to save what remained of Aztalan, supported by the Friends of Our Native Landscape and the Wisconsin Archeological Society. 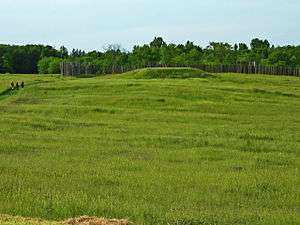 They made their first purchase of some of the land in 1921, three acres (12,000 m2) west of the stockade and containing eight conical mounds, and presented it to the Wisconsin Archeological Society. Work for preservation continued. In 1936, the state's archeological and historical societies petitioned the federal government for funds to reconstruct the stockade, without success, although during the Great Depression it funded archeological work and preservation at numerous ancient sites around the country. In 1941, the newly founded Lake Mills-Aztalan Historical Society began an energetic campaign to preserve the stockade area. 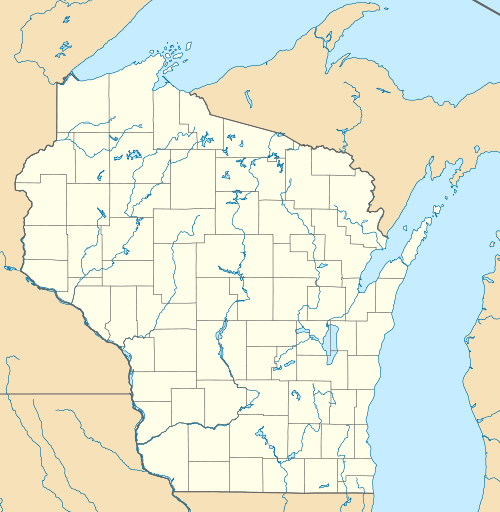 In 1945, the Wisconsin State Assembly passed a bill directing the State Planning Board to study the possibility of establishing a state park at Aztalan. In 1947, the Wisconsin State Legislature passed a resolution requesting the State Conservation Commission to purchase Aztalan. 120 acres (490,000 m2) were purchased to this end in 1948, and the Wisconsin Archeological Society and the Lake Mills-Aztalan Historical Society donated their holdings. Aztalan opened to the public as Aztalan State Park in 1952. Aztalan was designated a registered National Historic Landmark in 1964 and added to the National Register of Historic Places in 1966. In 1968, the state reconstructed portions of the stockade wall by placing new posts in the original holes. A section of this was also covered with the wattle and daub, but this has since worn away or been removed. ↑ "Aztalan". National Historic Landmark summary listing. National Park Service. Archived from the original on 2009-04-03. Retrieved 2008-06-30. ↑ Snow, Dean (2010). Archaeology of Native North America. Upper Saddle River, NJ: Prentice Hall. p. 237. ISBN 978-0-13-615686-4. Lawson, Publius V.; S. A. Barrett (Jan 1920). "The Ancient City of Aztalan". Wisconsin Archeologist. 19 (1): 7–15. West, George A. (Jan 1929). "The Story of Aztalan". Wisconsin Archeologist. New Series. 8 (2): 51–61, pl. 1–3. Ferry, Robert P. (April 1932). "Present Condition of Aztalan". Wisconsin Archeologist. New Series. 11 (3): 108–110. Barrett, S. A. (April 1933). "Recent Excavations at Aztalan". Wisconsin Archeologist. New Series. 12 (3): 74–86. Riztenthaler, Robert, ed. (March 1958). "Aztalan: Exploration and Reconstruction". Wisconsin Archeologist. New Series. 39 (1): 1–110. Birmingham, Robert A.; Lynne G. Goldstein (Spring 2006). "Aztalan: Mysteries of an Ancient Indian Town". Wisconsin Magazine of History. 89 (3): 50–53. Wikimedia Commons has media related to Aztalan State Park.